What skills does he need to have? How does the CoCreator create value with their customers? assist their customer implementing the their vision and transform their business. 2. Competencies What are the main competencies of the CoCreator? The CoCreator is an expert and knows the market inside out, taking each opportunity to create new business. The CoCreator has detailed understanding of current and future customer's strategy, based on detailed review of customer's performance and extensive top-level discussions. The CoCreator pro-actively analyses all available data and sharing conclusions with the team. The CoCreator does profound preparation upfront: need's analyis (ours/theirs), style/climate, content alll fact based and conducts win/win negotiations. The CoCreator possesses strong influencing skills and is knowledgeable about all the influencing techniques and how to apply them. The CoCreator develops a strong partnership relationship at all levels of the customer's organization, in all functional domains, both via formal and informal occasions. The CoCreator understands what motivates each individual and delegates responsability in function of personal development. The CoCreator can competently manage change by gaining commitment through consultation and consideration of stakeholder impacts. The CoCreator consistently demonstrates creative behavior and inspires it in others. The CoCreator is viewed as a leader who people want to work for because of the respect they demonstrate toward others even when mistakes are made. The CoCreator knows how to generate new insights for the customer by asking the right questions and make the customer aware of their own inconsistencies. The CoCreator creates new business opportunities together with their customers. He does not wait until a customer has an opportunity but pro-actively contacts customers to create them. 3. Motivation What motivates a CoCreator? The CoCreator’s work is one of the most important parts of his life. He is very pleased that he is in this line of work. He tends to take his work home with him and on vacations, too. The CoCreator feels good about his work because he loves it, and because he thinks, it makes the world a better place. The CoCreator would be upset if he was forced to stop working, and he is not particularly looking forward to retirement. But where does this drive come from? Having a job that fits with your personal strengths and ambitions plays a vital part. Boldness means that the CoCreator is well able to cope with highly emotional moments without affecting him or her too much. This is linked to the serotonine levels in the brain. CoCreators need to be able to remain motivated without any immediate rewards. This is linked to the reward circuitry in our brain which linked to the levels of dopamine. CoCreators need to be focussed while also remain aware of possible opportunities around them.This is linked to the wanderlust gene or novelty seeking gene. CoCreators need to score high on bonding as it will regulate their ability to interact within a social team. This is linked to oxytocin levels which plays a critical role in regulating a wide range of social. CoCreators need to be able to manage high amounts of uncertainty and stress in order to influence the world around them. The is linked to how well our body detoxifies stress hormones. How to co-create value with customers? How to identify the customer's goals? The firs step in a cocreation process consists of helping the customer to identify and express their goals. In a sales conversations the sales person adds value by providing solutions to the customer through their products and services. In a strategic conversation the sales person adds value by helping the customer to gain new insight by questioning and challenging the customer's thinking using a socratic approach. 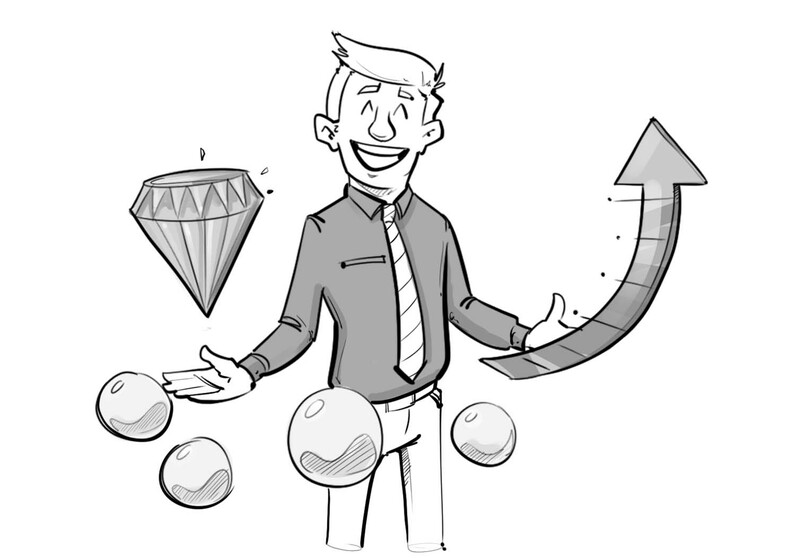 How to design the value proposition with the customer? The second step consists of designing the value proposition to help the customer to achieve their goals. We us Design Thinking which is a method to solve complex problems used by designers to cope with new innovative ideas. Frist we need to make sense of the information we gathered through the strategic conversations. The aim is to frame the customer challenge we will be focussing our attention on. Using ideation techniques we will produce possible solutions to address the customer’s challenge. The options are basis for the next co-creative session with the customer. Together with the customers you will analyse, reject and validate some solutions. Once you have selected the right solution you will have to prototype it and validate the approach using a pilot project. 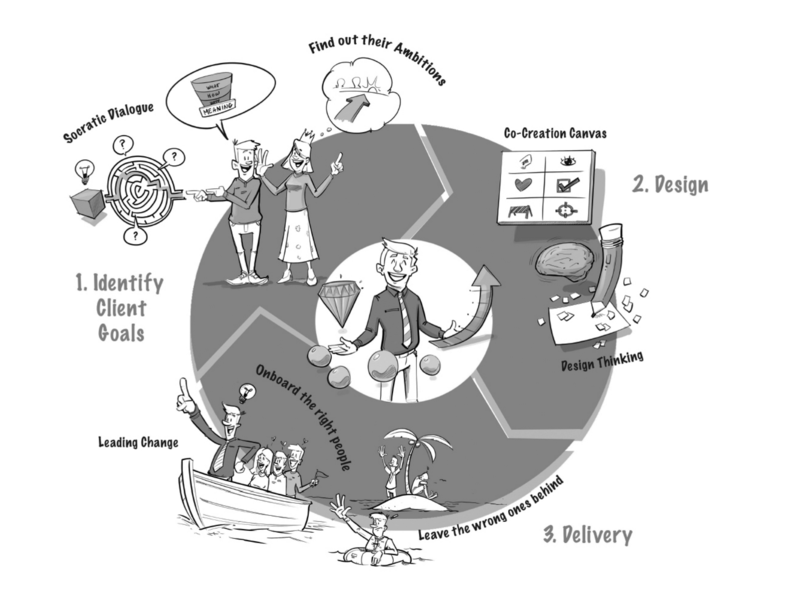 How to manage the co-creation process? The last phase on consists of implementing or delivering the value proposition together with the customer. As a co-creator it is your task to get the project going but most importantly to lead the people (get them onboard your project), both within your organisation and within the organisation of the customer. This requires change management, leadership, persuasion and project management skills in order to help the customer to transform their business.